Apple pie intimidates a lot of people. Despite looking relatively simple and ordinary, it can be tricky to get the filling to have the right consistency. You want the filling to be thick but not dry, if its too liquidy the crust will be soggy. You want to be able to see the apple slices; tender but not mushy. You want the crust to be flaky and tender, not dense and dry. 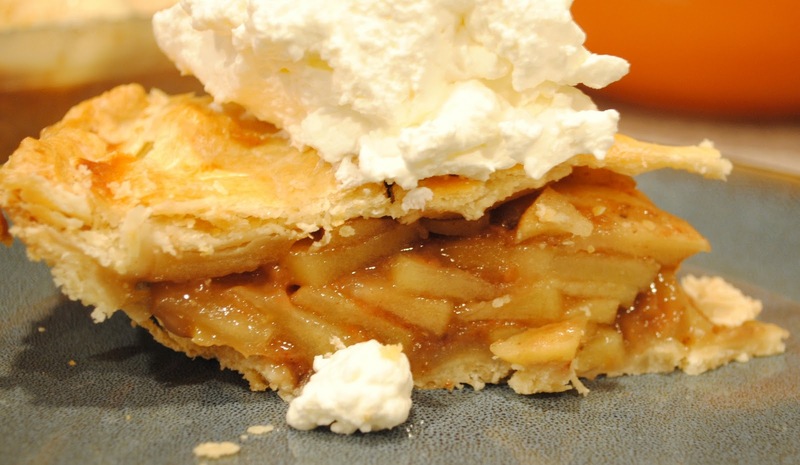 I'm by no means an expert on apple pie, but here are a few tips that have worked for me. Apples: Get a mix of apples, that way you are likely to have some of the best characteristics of each variety. I like granny smith, pink lady, and honeycrisp. Try to cut them all into slices of uniform thickness so they cook at the same rate. Sprinkle the lemon juice on the sliced apples right away, if its going to take you a while to slice them, sprinkle some on the cut slices as you go. Thickening agent: I use cornstarch rather than flour, you can use either but I prefer cornstarch as I think it works better. Filling: Mix your filling together and let it sit for a bit while you prepare the crust. The sugars will draw some of the juices out of the apples and allow the cornstarch to work it's magic. It's going to look like you have too much filling but you really want to pile it up high because the apples are going to shrink when you bake your pie and you don't want to have a hollow crust. 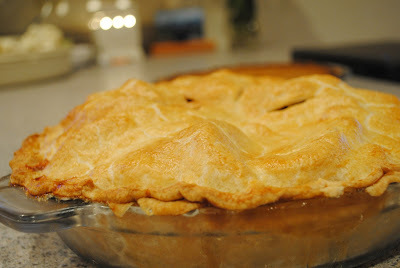 I always like to use a deep dish pie plate for apple pie. Also make sure you put a cookie sheet under your pie pan when you put it in the oven. There will almost always be a spot where the filling leaks out and bubbles over, it's much easier to clean up a cookie sheet than a sugary burned apple syrup off the bottom of your oven. Crust: Use cold butter, really, really cold butter. You can freeze it and grate it with a cheese grater or your food processor. If you don't want to do that, cut it into small pieces and then return it to the refrigerator/freezer. You want the pieces of butter to remain when you roll out the dough, its those streaks of butter that lead to an extra flaky crust. I'm not sure of the source of this recipe for the filling, the crust is from Martha Stewart Baking. If you don't have a food processor, you can mix the pie crust by hand or in a stand mixer as well, I just think the food processor is the easiest. And if the crust intimidates you, pick up a package of the refrigerated pie dough, all you have to do is unroll it and it's pretty good. To make the filling, toss sliced apples with lemon juice and brown sugar in a large mixing bowl. Sprinkle about half of the cornstarch over apples. Add spices and stir gently to combine. After the mixture sits for a while, if it looks like there is too much liquid, add remaining cornstarch to thicken. Generously flour rolling surface and rolling pin. Roll pie crust to about 1/4" thick. Remember that it needs to be about an inch wider than the diameter of your pie plate plus twice the depth. Spray pie pan with baking spray. Carefully move rolled out crust to pie plate. Fill pie with prepared filling, mounding high above the pie plate. Dot with remaining butter. Carefully roll out top crust and center over top of filling. Press and crimp edges to seal as desired. Carefully slice 3-4 slits in the top of the pie to allow steam to escape. Mix egg white with one tablespoon of water and brush pie crust. Bake pie for about 50-60 minutes until crust is golden brown and filling is bubbling. If the edges begin to look too brown before the pie is ready, cover with foil and continue baking. Let stand about two hours to set before serving. Whipped cream or vanilla ice cream both make excellent toppings. I love these tips! Apple pie is one of the first things I ever learned how to bake and it's always my go-to dessert!